Waterfront site will house a $1.6m playground where children of all abilities can romp side by side. This integrated carousel, with space for wheelchairs, is just one piece of equipment that may be a part of the new, inclusive playground in Charlestown. A waterfront slice of Charlestown located next to the new Spaulding Rehabilitation Hospital is being transformed into a $1.6 million playground that will allow children with disabilities to play alongside other children without anyone knowing the difference. Plans for the playground call for what is known as inclusive design, an approach to building spaces that all people can access and experience the same way regardless of age or disability. That means no separate accommodations for people who are handicapped. “You wouldn’t have to choose to go to an accessible playground which may not have all the features that a typical child would want,” says Kristen McCosh, Boston’s commissioner for persons with disabilities. Rather, the plans “incorporate the accessible components into a typical playground so that a family could play together,” McCosh says. The playground is slated to be built on a 286,875-square-foot lot with views of downtown Boston adjacent to the new Spaulding building, which opened in April. A number of people who were injured in the Boston Marathon bombings on April 15 have been treated at Spaulding’s new location. Equipment being considered for the playground includes integrated swings and a carousel. The carousel has two slots for participants in wheelchairs to ride alongside others, says playground designer Cheri Ruane, who works for Boston-based Spurr, the design studio of engineering consulting firm Weston & Sampson. The swings will also be integrated to combine belted swings, infant buckets, and wheelchair swings, Ruane says. “No matter who’s out there, they could find two swings next to each other that would work,” she says. A poured-in-place rubberized safety surfacing will be used to make it easy to get around the playground, Ruane says. The playground will also be close to an accessible outdoor recreation area for adults and children run by Spaulding. McCosh says the idea for the playground came from Mayor Thomas M. Menino, who spent three weeks at Spaulding’s previous location at the end of last year as he convalesced from a long hospital stay. 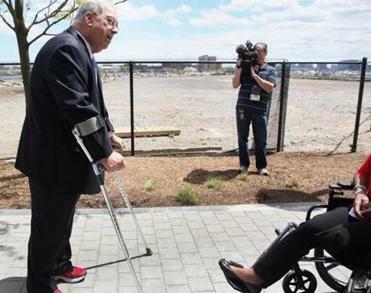 When Menino announced plans for the playground at the construction site in May, he was using crutches after undergoing surgery to repair a fracture in his lower leg. The city already has some outdoor play areas with elements that accommodate disabled users. Harambee Park in Dorchester was designed to be accessible for kids of all abilities. Also in Dorchester, the Dr. William W. Henderson Inclusion Elementary School, where students with disabilities learn alongside nondisabled peers, recently completed a wheelchair-accessible sensory garden, McCosh says. Demand for accessible, outdoor play areas in the city is growing. Dianne Lescinskas, who has a child enrolled at the Harbor Pilot Middle School, is trying to get an accessible play area, including a sensory garden and outdoor classroom, built at the Dorchester school. Like Henderson, the Harbor school is inclusive, and such a play area would give children a break from sitting in the classroom and provide outdoor learning opportunities, Lescinskas says. “The ultimate goal is to make this school playground accessible for all children not just for children with special needs,” says Lescinskas, a Savin Hill resident. Oz Mondejar, Spaulding’s senior vice president of mission and advocacy, says the new playground outside the hospital will be a place where children will attain milestones, like doing something independently for the first time. “When you get a chance to play, you get a chance to think about being strong, your future, and your role in it,” he says. Laura Crimaldi is a Boston.com producer. She can reached at laura. crimaldi@boston.com. Follow her on Twitter @lauracrimaldi.